Thanks to everyone who came together to make the parade such a success! Join one of Colorado’s largest celebrations in Downtown Denver. Celebrate community and culture with family and friends, because everybody can be a little Irish for the parade! Bellco Credit Union will be celebrating its 14th year as the presenting sponsor. 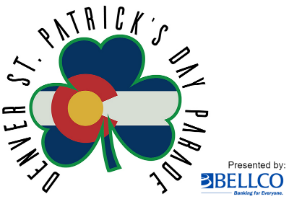 “The Denver St. Patrick’s Day Parade represents a strong sense of community for Bellco, and we're proud to be a part of it.” said John Rivera, Bellco Senior Vice President and Chief Retail officer. “Bellco serves the financial needs of more than 324,000 members across Colorado, and we prioritize our local event sponsorship as an important way to give back to our community. We congratulate James Iacino on being named Grand Marshal of this year’s parade, and we thank the parade organizers for their hard work in carrying on this beloved local tradition.” Follow Bellco on twitter and Like us on Facebook. Thanks to Breckenridge Brewery and their new Nitro Irish Stout for being a Premier Sponsor of the 2019 parade. Support Colorado Irish! Click here for parade discounts on season passes! Want to have some year-round fun with the Celtic community? Join the parade committee and help us put on this amazing community event, plus plenty of members-only events during the year.